First offering of Katsugi Okedo at LATI! This unique style traces its roots from the Korean Changu (or Janggu), popularized by Kodo back in the 80's. 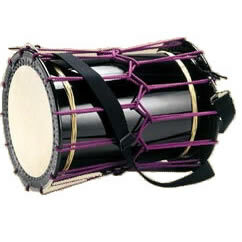 The drum is slung on the left shoulder and is a playful taiko addition since it allows mobility of the drummer. In this course, you will learn not only the basics of Katsugi Okedo, but how to tie the rope, attach the shoulder strap and maintain the instrument. Come join us for a fun-filled class using the most mobile taiko! Important NOTE: LATI will be closed for the week of May 31-June 6 due to involvement in Maui's Taiko Festival with Zenshin Daiko.